If you read up on kapeng barako, you are more likely to get confused than not. 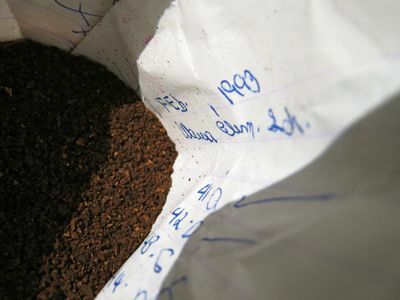 It seems it is definitely known as Liberica coffee, and while some sources say it is indigenous to the Philippine archipelago, a little further research suggests it originated in Africa. I suppose over the past several hundred years, the Liberica has evolved into our own strain or unique type of coffee. Liberica coffee probably makes up less than 1% of the global crop of coffee, with the majority being Arabica and Robusta varieties. I am not a coffee fan, but I can tell that the local barako is strong and highly acidic compared to some of the more common globally marketed varieties. You can almost feel the caffeine coursing through your veins when you take a sip early in the morning. i’m not much of a coffee drinker either but i remember this coffee growing up in batangas.we always have a pot of this on the stove.we boil it along with water and brown sugar. i remember our neighbor who would dry the used ground and mix it with the new ground for next days pot.my grandma in quezon harvest, dry, roast and grind her own coffee though and she makes her own tablea (cocoa disks for choklate) as well. I love coffee and Barako is my brew of choice. When I was doing my thesis in Balayan, Batangas my host would serve this every morning, steeped in a pot of just-boiled water and strained through katsa to catch the grounds. Without cream and with a touch of sugar, this was the perfect fuel before I hiked around the different baangays for my feasibility study. Growing up, my mom used to prepared coffee in the morning by boiling ground coffee (just don’t remember what variety though). Its so funny you should mention blue crabs and this batangas coffee within a few days – my mom brought me back a huge batch of thisthe other week from her annual visit to the Philippines – yes wrapped in the unconventional paper. The stuff is mighty – the coffee smell has permeated my fridge – but was a hit when I served it to Baltimore Sun reporters (with my afforementioned puto) on Saturday – they are doing a story of my 1790’s colonial which has been transformed by me into a bahay kubo with all my filipinia. It leaves quite an inky residue in the coffee maker and cups – but is delicious – and strong – I tempered it down for guests with cardamom seed in the filter ala Lebanese and North African style. When the Lopezs partnerened with Starbucks in the late nineties they ran a limited edition Batangas brew – I wish they had continued with it globally because it wold have been a great hit globally. Now what will they wrap your next purchase of coffee with? An essay maybe or an excuse letter would be interesting. yikes I meant the Tantocos (not the Lopez family) with the Starbucks- yeesch I’ve been away since 2001!!! That was funny lee!MM, dont you think the oil from the freshly ground coffee will have a reaction with the ink of the recycled paper?And that reminds me of the old fashioned way of wrapping up a “Bugong or Baon” or the pancit palabok take out from the market—-wrap in banana leaves then wrap again in old newspapers!Great recycling! I’m also a coffee lover! I take it as it is: no sugar or cream! I think I got hooked into brewed coffee when my brother sent home (in series) bricks of Gevalia vacuum-packed coffee and a drip-brew coffee maker. Then he sent us a coffee grinder, too. I started buying whole beans from Starbucks and Seattle’s Best and then also the local varieties. eating food wrapped in newspaper will give you a sense of history. germs also. I find most coffee from the south are quite acidic, ‘maasim’ type as compared to the north which has a ‘bolder’, much less acidic taste. In fact, my hubby prefers it over blue mountain and the one by mail order…gevalia? I can only appreciate ‘acidic’ coffee(arabica?) if it is flavored otherwise I’m a huge (Benguet)coffee drinker and I just luuvvv the smell of freshly brewed coffee in the morning! been to nasugbu again? !omg i missed that! !i shouldve seen you there..btw,thats just 1 our of 101 interesting foods in nasugbu..thanks for featuring my hometown. We buy two types of coffee—barako and Lipa coffee. Somehow, I am not sensitive to the difference of the two although my husband thinks that the Lipa coffee is finer in taste. We only drink brewed local coffee during Sundays to control our caffein intake. I also like the aroma of both of these coffees! It makes our Sundays so extra special as compared to the other special days of the week :-)! Thanks for that bit of info, MM! Thanks for your diligence! MM, what a charming post! I like the way this blog seems to be heading. All the entries were fun to read too. when I flew back to Boston from manila last november, I had 2 kilos of ground cafe barako as pasalubong from my brother. I enjoyed it while I was in the Philippines, I mean it was the alternative from Instant coffee, but after brewing some I was a bit underwhelmed, somehow the magic is gone, maybe because dunkin Donuts coffee is available, peet’s and starbucks, and the barako just tasted bitter, must be the water! or is it the Half and half not a good mix with the barako. But being from New England, there is no coffee to start the day with but with a Dunkin donut coffee. I seem to have been hard-wired by having worked with Jamaicans for close to twenty years who having failed to convert me to the superiority of their husky mangoes and lakatan bananas tried engratiating themselves to me with their Blue Mountain coffee beans. It worked. I think that their coffee can only stand aside to the Hawaiian Kona or to some other that is said to have passed through the digestive tracts of wild cats. It might be high heresy as I am right now in an internet cafe a block away from Copacabana beach but their coffee here stinks. Both the beans and the way they make em. At home, I use a vacuum pot that was popular in the decades flanking the WWII that I got from ebay for US$10. Neither Ricardo Montalban nor Juan Valdez’s coffee quite measures up. 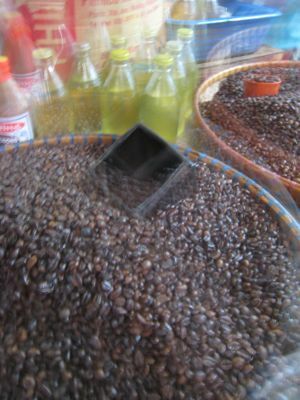 Apicio, the kopi luwak from Indonesia, now also “manufactured” in the Philippines are beans that have passed through the intestinal tracts of civets or similar beings. And yes, they were originally collected from dung piles…but now the animals are caged and they are fed the coffee that is then cleaned and roasted when it comes out their rear ends… I am not a coffee fan enough to pay 10x the price of everyday coffee for the kopi luwak but perhpas one day, for the sake of curious readers, I may at least try it… weng, we are in Nasugbu fairly often as we have a place at the beach there… Beth, rather than chemical reactions, like lee, I wondered about how sanitary the 15 year old paper might be! I am also a huge coffee fan, but Starbucks is definitely not my brew of choice (too dark/overroasted). I have read about barako and wonder how it compares to the kopi luwak, not that I have had either. I’m more of a Tim Horton’s/Timothy’s/Second Cup man myself… I do remember back home there was a brand of very local coffee that was “roasted” in a karahay with either butter or margarine. The coffee had a slight yellow film of oil on top when brewed. It was a wonderful flavour! I love kapeng barako? Of course the taste differs from brand to brand coz of the processing. But I am a big fan of the blend at Bag of Beans in Tagaytay. A bit pricey but a far cry from the civet coffee which they also have but i have not tried. And yes, i lke my coffee strong but with lotsa milk and sugar. =) I am a sissy. Gosh, Fried Neurons, don’t think you are alone on this. You remind me of my aunt who used to do the same thing…pour coffee on fried rice. My husband and I buy ground coffee beans from Figaro fairly often. I love the aroma of coffee especially in cooler climates. A cup of coffee surely starts my day right. Starting and ending the day with coffee is something I don’t miss out! While some may not be able to sleep with it, mine is reverse, I can’t sleep without it.. But to truly enjoy, it helps if its a good brew with a wonderful aroma…Ah, coffee just can’t live without it, hehehe. I read an article that coffee is said to ward of dementia but you have to take it at least 2 times a day minimum! So, I guess being a coffee lover now has its benefits. Hurrah! for coffee lovers. When I visited Agoncillo Batangas last year, (on a mission trip), I made sure I bought some “barako” from the local market. I bought some here to Houston, and when we brewed it, it did not taste any better than the store bought canned brand. I found out later that hindi pala tutuong barako yung nabili ko.. sus, I did not know that “mandaraya” sellers exist in local small town market. Wawa Elementary School… this too brings back memories. Growing up, we always thought what a sybaritic life it would be if we attended the “Mataas na Paaralan ng Wawa”. From class then directly to the beach! Oh well, maybe in my next life. I tasted Barako coffee when my mom came to US for a visit. It is comparable to some of the good coffee here in US. Could please give me info on where to buy this in Batangas. I prefer to buy a freshly roasted coffee. Regina Orio, seems to be heading? For adepts of this site, it has been like that since day one, stylish, engaging and not a whiff of the sweat expended in producing the marvelous movable feast. Where can I purchase Kapeng Barako? When I was home(PHILIPPINES). I just drink instant coffee. My husband is caucasian and couldn’t start a day without coffee. We have been roasting our own coffee for 3 years now. And the aroma and taste are really great. We order green coffee beans from Hawaii too bad I dont see any crop from the Philippines. 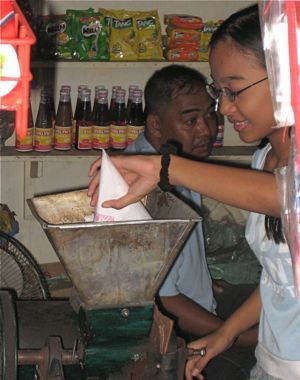 I would love to try the kapeng Barako. Rev. Manny T said that there are two kinds of seminarians. Charismatics and coffeematics. 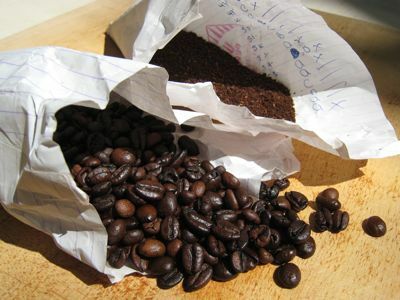 i love coffe too… anyone can offer a coffee.. i want to buy ground coffee.. kindly txt us 09238801335 and will call you. Hi everyone! I’ve been reading this forum and it sounds like a lot of you have been looking for kapeng barako here in the u.s. I am currently located in los angeles and currently trying to put things together with regards to importing fresh kapeng barako. So anybody interested to buy from me, probably in the next couple of weeks, just email me at chrismatienzo@aol.com. hopefully, everything gets pressed with fda regarding the packaging and labeling then I can start importing here.